Green Week Linkup: First Day of Spring! Happy First Day of Spring! As much as I've loved the few spring days Oklahoma has had so far, it's getting pretty frustrating to go back and forth all the time. Friday's high is 70 and Saturday's high is 40. I mean, what is that!? Unfortunately, this outfit isn't spring-y at all. Ironically, last year's first day of spring outfit wasn't spring-y either. Oh, and I'm wearing the same vest. It creeps me out how much I just do the same things over and over. You know it's bad when your dog starts to notice your habits too. For the longest time, I couldn't figure out why right when I walked through the front door from work, Winston greeted me and ran to my bedroom door, waiting to be let in. I finally realized that when I get home from work, I immediately go to my bedroom and change into a t-shirt and shorts. I am a creature of habit, and not in a good way. Link-up info after the jump! Isn't it funny how we have our own routines and habits? I definitely always follow my routines! That's a really cute shirt. I love the colors in it. 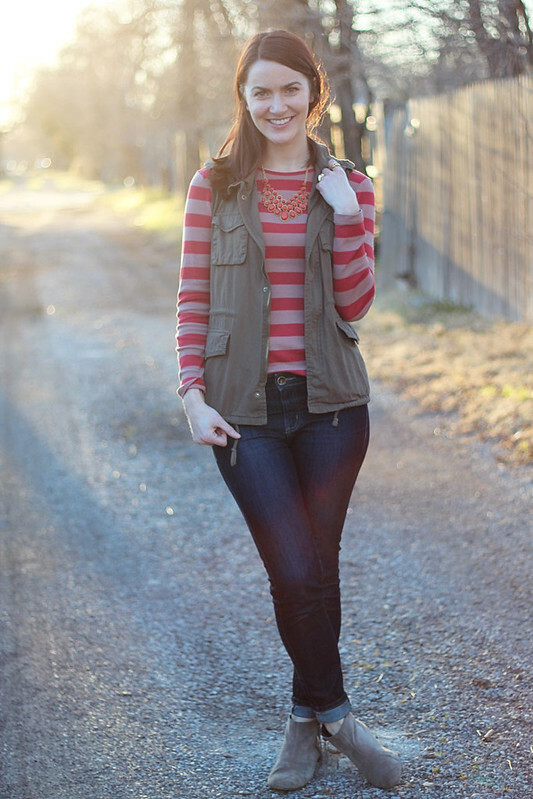 I have wanted to wear my red striped top with my vest, but was worried about red and green together, but you really pulled it off! I wore a skirt today in honor of spring! But...with tights...and a dark red cardigan....sooo I guess it's not really all that springy haha. I really like this look. 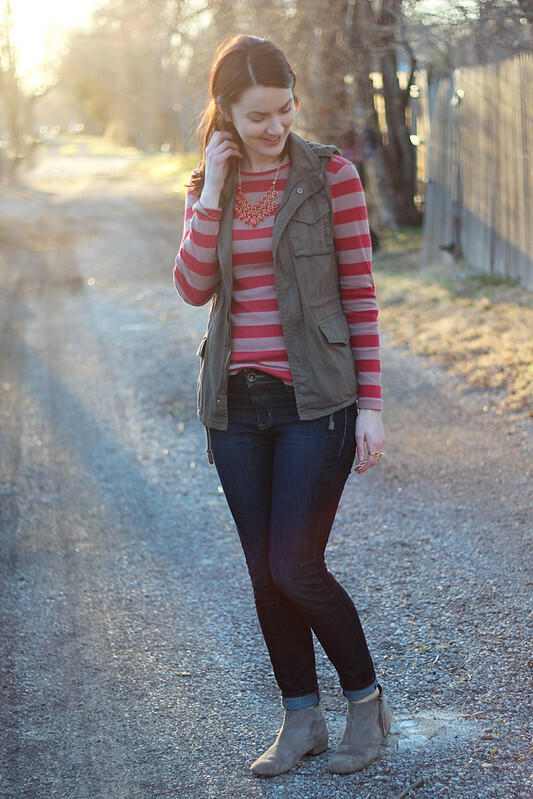 I've worn a pink striped top with my olive vest before and really liked the combination. Dogs are funny... and so wired by habit! I didn't even realize it was spring until someone on a talk show said so. All I know is that it's windy as heck today. 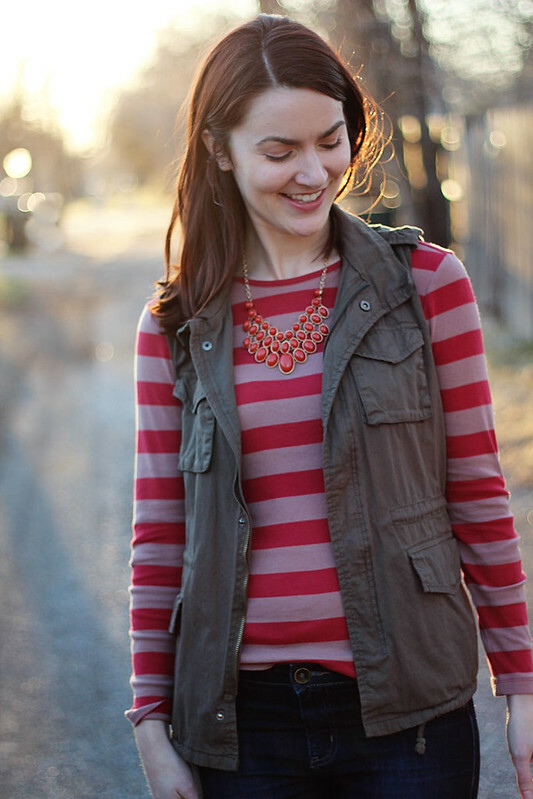 Also, I really like the coordinating necklace with the stripes! Haha I'm an insane creature of habit. I'm in leggings and a sweater within 5 minutes of getting home every single day so you're not the only one! Thanks for hosting the link up! I am a creature of habit too. I love both this year and last years looks, so cute! I like all of this outfit!! And I'm a creature of habit too, except my default is to run to the pantry as soon as I get home. Priorities, haha. Thank you for hosting! I love a good vest. I do not think my dogs would know what I am doing. At any time. Ever. Smart dog you've got there! I love the way you style your outfits. I would wear everything you put together! Great outfit! Stripes are my favorite, as are skinny jeans and ankle boots. Cheers to spring! Oh, I am definitely a creature of habit. Get me out of my routine and I am a hot mess! 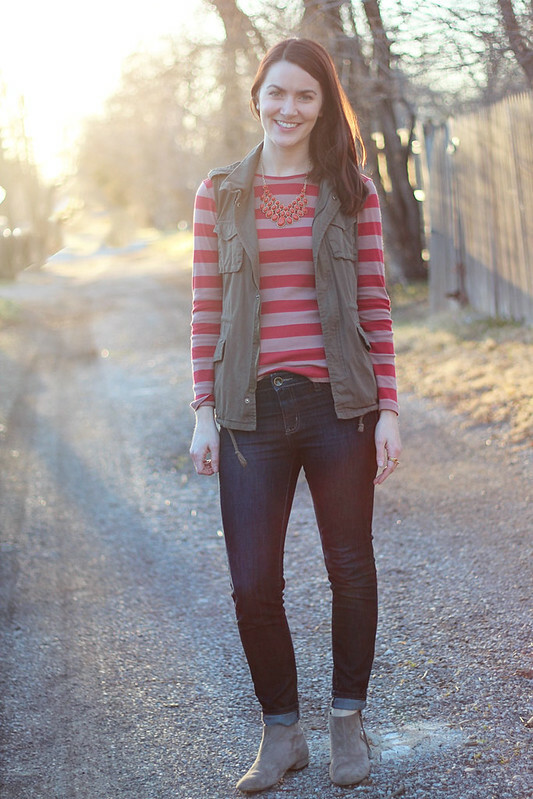 Love the stripes paired with the vest. Very cute outfit! Spring-y or not you look fabulous! I really do love that vest - you could wear it everyday and I would be okay with that. Happy Spring! I love that top and necklace combo! It looks great! 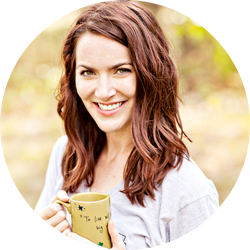 Thanks for hosting and checking out my blog! Oh, I love that vest! I think we are all creatures of habit in some way or another! I know I do the same thing over and over!! Anyway, I love your vest -- very cute! Thanks for stopping by the other day too!! This was my favorite outfit of yours during Green Week. It all looks so chic in a casual way. Also I loved your braid the other day. I too am a creature of habit, for so many things. When it works - it works.